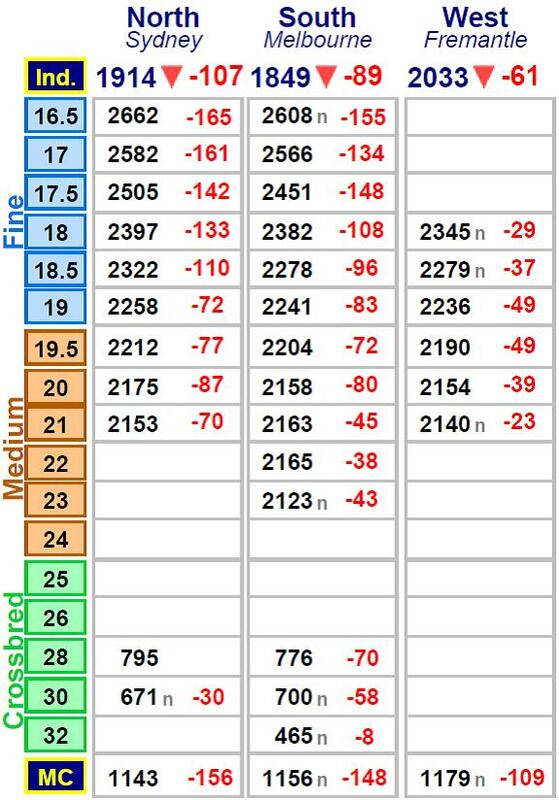 AUSTRALIAN wool prices fell by up to 155 cents this week and growers resisted the price corrections as reports of limited new business and forward contracts undermined the market. AWEX senior market analyst Lionel Plunkett said the market continued its downward slide into negative territory, with the Eastern Market Indicator falling 72 cents on the first selling day — the largest daily fall in the EMI since 2003. “This was followed by a further 24-cent reduction in the EMI on the second day of selling. “The EMI lost a total of 96 cents for the week, closing at 1874 cents,” he said. Mr Plunkett said 6.9 percent of the 34,522 bale offering was withdrawn prior to the sale and the large price corrections were met with firm seller resistance. “The national passed in rate was 23.6pc for the week. Mr Plunkett said a heavily reduced market was evident from the outset, and as the sale progressed buyer confidence slowly eroded, pushing prices continually down. “The finer microns were the hardest hit in the falling market. He said the 19 micron and coarser fleece wools did not sustain the same losses and were generally 50 to 75 cents easier. Mr Plunkett said the skirtings followed a very similar path to the fleece. “General losses of between 100 and 150 cents were experienced and wool finer than 17.5 micron was most-affected. “The oddment sector had another week of large losses,” he said. “Locks, stains and crutchings fell by 100 to 150 cents, pushing the three carding indicators down by an average of 138 cents. 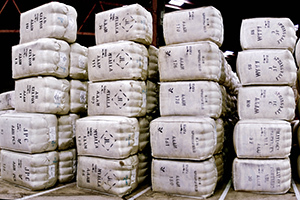 Australian Wool Innovation’s weekly market report said as the past six or more years have seen price gains predominantly on the back of demand, the rapid retraction in price levels this week was caused by the slowing of buying by mainly Chinese manufacturers. “Whilst it is clearly not that easy to explain or predict why markets of any product react in the way they do, on the surface the current wool market behaviour seems to be going against the most logical of thinking. “Supply is forecast to be in serious decline and demand for wool products, in particular Merino, at retail and consumer level remains strong, yet the market has taken this downturn,” AWI said. “Demand is the key price driver and the most substantial barometer for a product like wool. “Supply issues, although influential at various pinch points in time, at both the high and low end, are very much secondary as far as price determination is concerned,” AWI said. AWI said the most popular of reflections this week as to why the price fell so hard was the simple fact that exporters to China were experiencing very limited inquiry for new business and any new forward contracts were extremely hard, if not impossible, to come by. “Some pre-sale discounting in forward levels being offered into China were being reported and this provided the inevitable feeble lead in to the start of auctions. “This languid atmosphere then compounded as selling progressed and the first day closed under a very sombre tone, as more and more buyers withdrew almost entirely from their normal purchasing operations,” AWI said. “From the other side of the industry, information from manufacturers is that the prevailing high prices of the past months has proven problematical to pass on through to retail. “As the price moved so swiftly upward through the course of last season (up over 500 cents), the manufacturers were able to use a two to three-month average (length of supply chain) price to sell out the other end, so the top of the market price was no gauge as to the ability of the current price of wool being able to move all the way through to consumer,” AWI said. However, AWI said machinery demand in China has grown this year, with installation of even more wool processing capacity into some parts of that country. “This seems to go against the trend, as it was commonly thought that high labour rates and higher associated running costs had some Chinese manufacturers looking at other countries for some first and second stage manufacturing opportunities. “Given the trade disagreements with the USA, those discussions may be being further hastened,” AWI said. “What has changed now though is that factories are prepared to sit out and leave machines idle rather than running machines at a potential loss. Next week the national quantity increases to 40,351 bales. “The slightly better tone to the market that was seen on the final day needs to strengthen in order to arrest the current negativity,” AWI said.